Not to be confused with thick Sicilian caponeta made with eggplant, Neopolitan caponeta originated with local sailors who tossed tomatoes with a dash of seawater with the ship's store of hardtack. 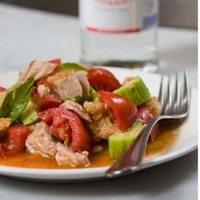 We have added cucumbers and capers to this simple tomato and bread salad, using baked leftover pizza dough torn into bite sized chunks, and accented the flavors with tuna. Toasted crusty bread also makes a fine salad, but it's worth keeping this recipe in mind when you have extra dough after a pizza-making frenzy. From "A16 Food and Wine" by Nate Appleman and Shelley Lindgren. Ten Speed Press. Tear the bread into large bit-sized pieces. In a large bowl, toss the bread with about 1/2 cup of the olive oil, coating the bread evenly. Spread the pieces in a single layer on a rimmed baking sheet and toast for about 10 minutes, or just enough for the bread to turn slightly golden but not as crunchy as croutons. Remove from the oven and let cool. Slice off a piece of cucumber and taste it. If the skin is bitter, peel the cucumbers. Otherwise, keep the peel. Halve the cucumbers lengthwise and remove the seeds with a spoon. Cut into chunks about the same size as the tomatoes. Place the tomatoes and cucumbers in a large bowl, add the capers and basil, and season with a pinch of salt. Drizzle the remaining 1/4 cup olive oil and the vinegar over the mixture and toss thoroughly. Add the tuna and bread and toss again just until incorporated. Arrange the salad on a platter and serve immediately. Simply wonderful summer salad; easy to make. The texture of the cucumbers and bread are just fantastic. Highly recommend; I made this for myself as a full dinner (it's so hot right now in SF). Loved it and will make again for guests. Excellent. I would make for my next guests. Great for summer! Delicious and easy to make - no oven needed! This looks wonderful. I will make it soon. Thank you for posting! Chef Appleman - While the best things in life may not always be free, they can be deceptively simple. This recipe is a perfect example of the Appleman touch. Brilliantly simple, texturally satisfying, pleasing to the eye and nose - and totally delicious. Follow this recipe out the window, folks - it needs no modification. This is regular summer fare for us. I appreciate the contribution. A16 Food and Wine is a fantastic cookbook that features the wine and food of southern Italy. Beautiful recipes and pictures easy to follow text. Highly recommend for any home cook.